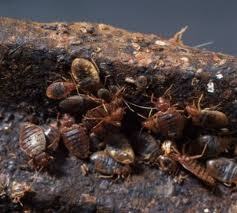 People regularly travel to and from all parts of the world, including areas where bed bugs are everyday pests. Business and leisure travelers frequently travel between all the continents. Developed countries are increasingly multicultural, with residents moving back and forth from their homelands. In many cities there are large populations of illegal aliens or temporary workers that are constantly shifting in and out of group residences, mostly in low-income apartments. It is not uncommon in Washington DC, for example, to find a dozen people or more living in a 3-bedroom apartment, with the mix of people constantly changing as jobs change and as people return to their home country or move into another city. Those residences can become severely infested with bed bugs and act as a focus point for other bed bug infestations in the building. Thrift shops have become more popular and so have antique markets, flea markets, and garage sales all of which increase bed bug risk. Perhaps because of the repellency of several insecticides being used today, bed bugs seem to be moving more, going from room to room, and even becoming functional during the day. Up until recent times, most people under 50 had never seen a bed bug. DDT is long gone, as are the other chlorinated hydrocarbon insecticides. Modern insecticides are proving to be rather much less effective against bed bugs. We may be facing various levels of insecticide resistance. Technicians no longer frequently spray baseboards or apply insecticide barriers around beds and furniture or otherwise spot-treat inside apartments, hotels, and similar sites. Such monthly or quarterly treatments, even when used for pests such as cockroaches, would also control new infestations of bed bugs. Today, insecticide baits are the most customary substitute for traditional sprays, but baits are specific for specific pests such as cockroaches and ants. There are no baits for blood-feeding insects resembling bed bugs. If you have Bed Bugs in your home you need to call the bed bug pest control experts and leave those bed bugs to the professionals that know how to get rid of your bed bugs. We have bed bug service professionals for the Trenton, NJ and Philadelphia, PA areas and cover most all of the surrounding area of NJ and PA. Our professional bed bugs service technicians are available day and night to solve those pest control problems associated with bed bugs.